Back in June of 2009, I was sent the jersey of an early 20th Century Hall of Famer for my analysis and opinion. Projects like this are simply the dream of any baseball researcher and uniform evaluator. Unfortunately, dreams can quickly turn into nightmares. In this case, it cost someone $26,450. Below are the comments I provided based upon my evaluation of the jersey that turned out to be Lot # 381 from the September, 1999, Sotheby’s Barry Halper Auction. The player alleged to have worn the jersey was Hall of Famer Jimmy Collins. The plates referenced in my evaluation of the Collins jersey are numbered I-X. 1. 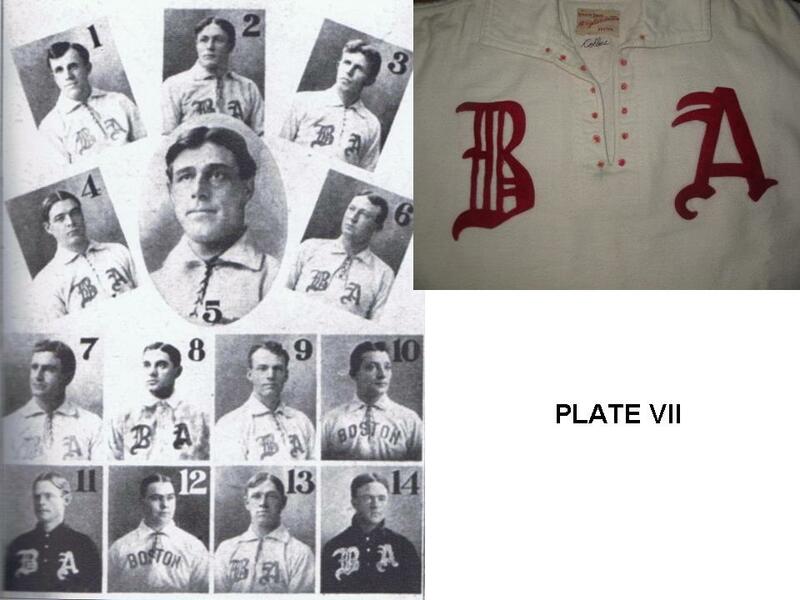 Dating the jersey: The jersey features a full collar with lace up neck closure and old English font “B A” on the crest. In very general terms this places the jersey to the period of roughly 1902-1908. 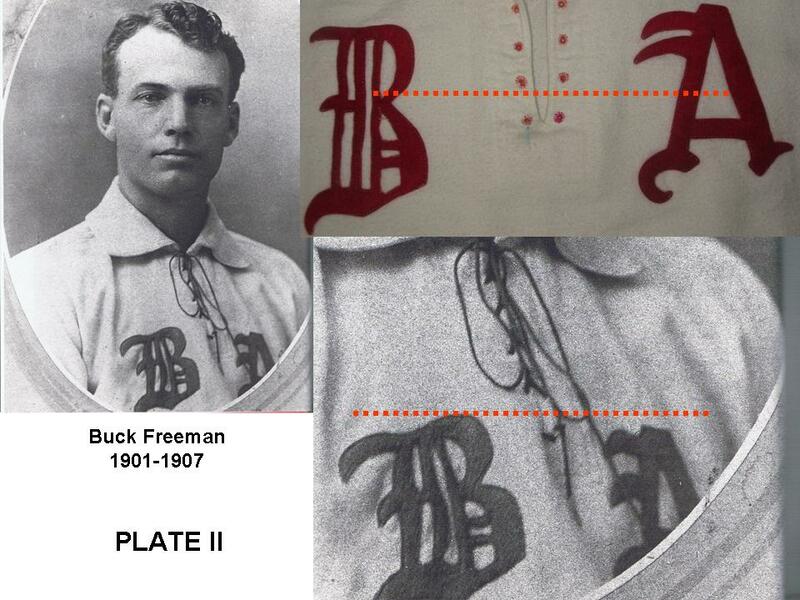 While early 20th Century uniform styles can be found in years other than depicted in references such as the “Dressed to the Nines” uniform database of the National Baseball Hall Fame, this style has been referenced to both 1902 and 1908 for the Boston Americans. 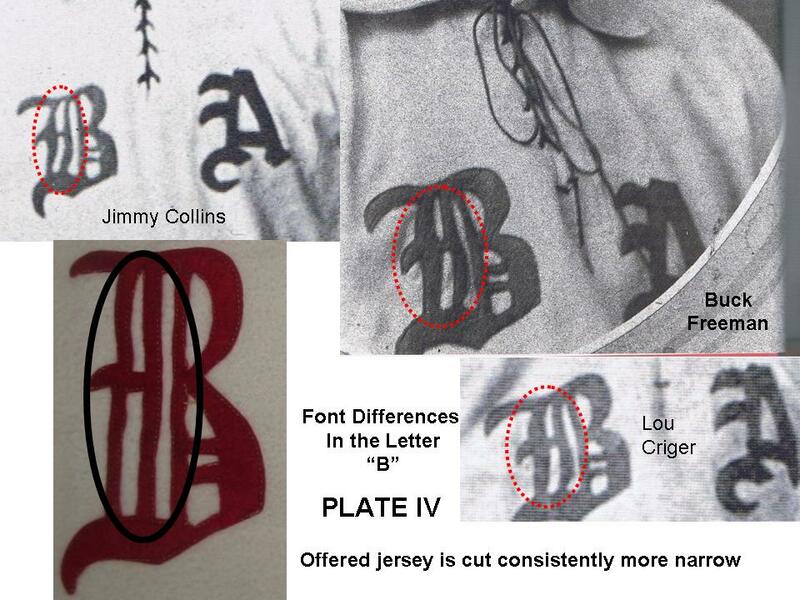 The jersey is attributed to Jimmy Collins as indicated by the stitched name “Collins” in the collar. Jimmy Collins was the only player with this surname playing for the Boston American League ball club during this general period. Jimmy Collins played for the Boston American League team from 1901 through June 7th, 1907, when he was traded to the Philadelphia Athletics for John Knight. As such, the jersey is not likely a 1908 offering ordered for his subsequent use. 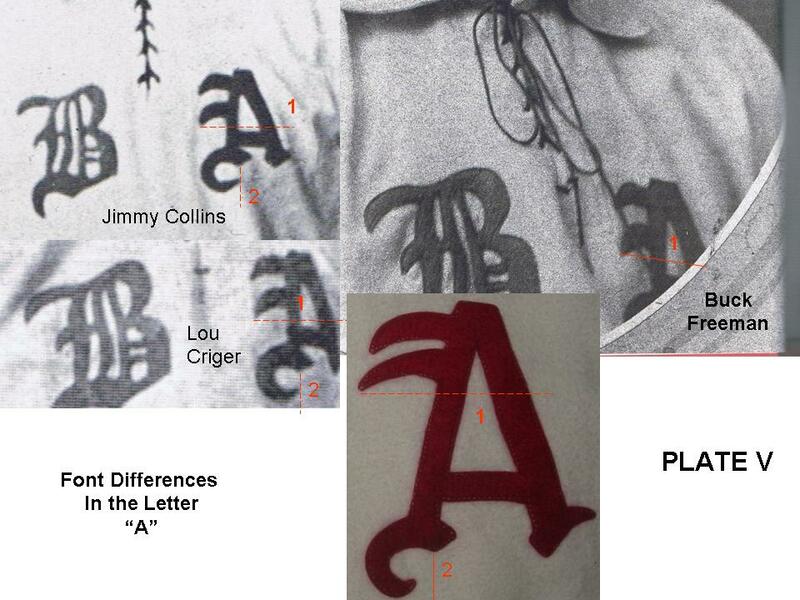 a.PLATES I-III show that the placement of the gothic “B” and “A” are lower than what period images show, including one for Jimmy Collins. b. PLATE IV highlights the font inconsistencies of the letter “B”. c. PLATE V highlights the font inconsistencies with the letter “A”. d. PLATES VI and VII show that while there are known variations of both font style and placement (as well as some jerseys found with button closures as opposed to draw strings), this offered jersey can not be identified as one of those variations through combination of both font style and placement. 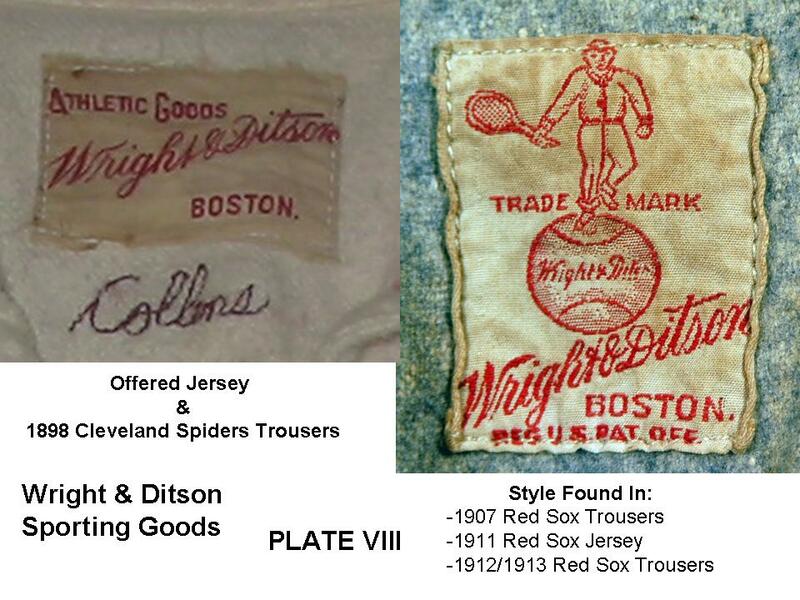 This style manufacturers label is the same type that can be found in the 1898 Cleveland Spiders trousers. (PLATE VIII). 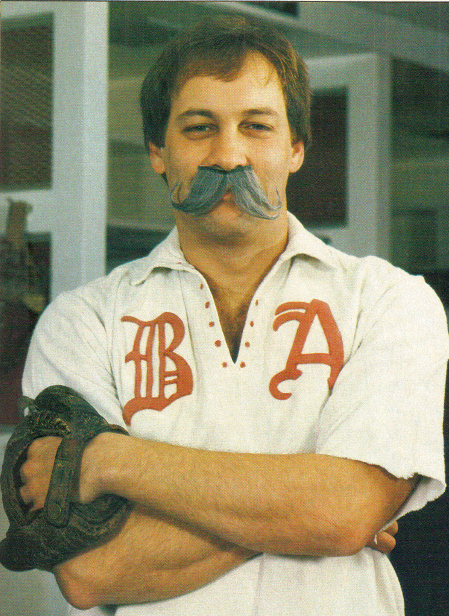 Given the cited examples and the co-location of W&D Sporting Goods with the ball club in Boston, I have no objections with accepting W&D as a likely supplier of uniforms to the Boston American League ball club during this time frame. 4. Size: The jersey is without any tagged or recorded size and this is typical for jerseys from this time frame. The measured size of the jersey is approximately a size 50 as the shirt measures some 25” across the chest. Jimmy Collins is listed as being 5’ 9” and 178 lbs. As such, it would appear that this jersey is quite a bit larger than what I would have expected to see. The images provided of Jimmy Collins from this same time frame do appear to show him wearing jerseys that appear disproportional with respect to his frame or build. 5.Construction: The jersey is constructed with early 20th Century characteristics including the Western style collar and shoulder construction. The shirt features ¾ length sleeves with button openings to facilitate the attachment of sleeve extensions. These are all consistent with what you would expect to find in an early 20th century offering. However, the fabric used for the body of the jersey is atypical. Under UV lighting, the entirety of the body gives off a fluorescent, something I would not expect to see if the jersey was constructed with non-synthetic fibers of the period. 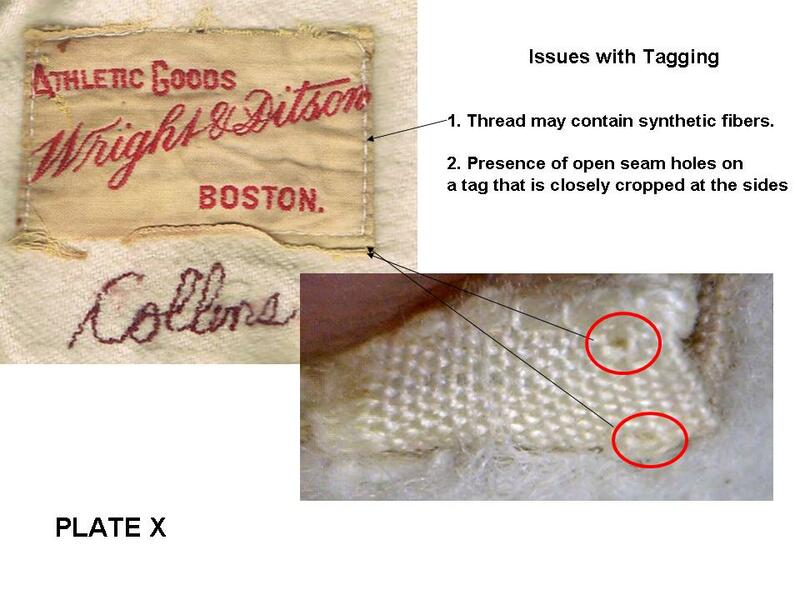 In addition, the white thread used to affix the Wright & Ditson manufacturers label in the collar presents the same problem. 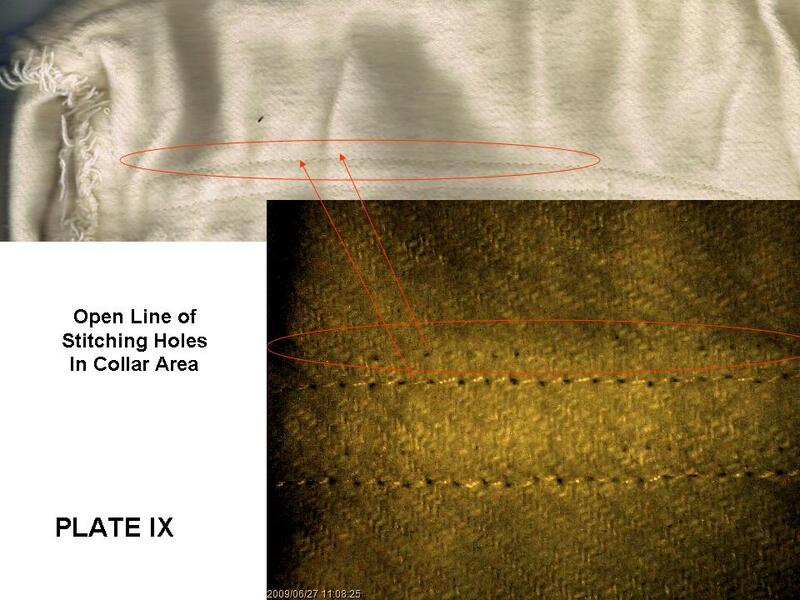 Additionally, there is an open line of seam holes in the rear of the collar area. (PLATE IX) This is problematic when you consider the W&D manufacturers label and the player identification of Collins is only sewn through the first fold in the collar. The jersey does feature seven (7) eyelets in the neck area to accommodate the drawstring. This number is appropriate for the period as indicated by the provided images. The closing stitching of the jersey where separate portions of fabric are joined is rough in appearance with respect to both cut and stitching. This is also atypical from what I would have expected to find. The W&D manufacturer’s tag, while correct for the period, does feature open seam holes as well when the tag is rolled back (PLATE X). 6. Use and Wear: With the exception of some fabric bleed from the felt “B” and “A” to the inside of the jersey, the jersey shows no real signs of use, wear or aging. There is one small 1 ½” fabric repair in the lower left front of the jersey. 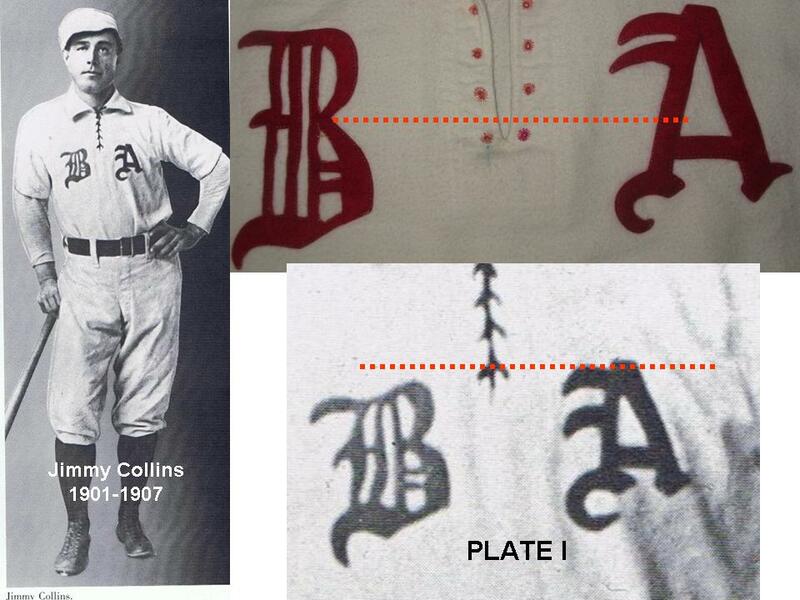 There is also some slight fabric bleed around the stitching of the “Collins” in the near of the collar. UV lighting also shows pinkish/red blotches throughout the rear tail of the jersey. There is also a blue pen like stain just below the right bottom drawstring eyelet. Of note is the fact that it appears two different colors of thread may have been used to construct these eyelets based on how those fabrics have faded. Finally, UV lighting shows no signs of other stains or soiling that one might typically expect to see. OPINION: Based on the inconsistencies cited with respect to font style and placement, jersey size, fabric used for the body and the manner the garment was finished, as well as what may likely have been the collar opened up to accommodate the adding of the W&D manufacturers tag and “Collins,” I am unable to authenticate this jersey as one that would have been issued to and worn by Jimmy Collins while playing for the Boston American League from 1901-1907. Dreams and nightmares can be recurring. When this happens, we seem to recall what we saw or experienced in an even more vivid manner with each subsequent occurrence. To cut to the chase, I think I’m having a recurring nightmare. Last month I was sent some images of various jerseys by the folks at Hauls of Shame and asked if I could provide any insight or thoughts on them. My experience and background in the area of providing opinions on baseball uniforms is a bit different than most who work in this field. I have never been a dealer of the product, but rather a researcher and collector. By profession, I am a recently retired Army Lieutenant Colonel having served as both an Infantry and Intelligence Officer. Along the way I have been trained in various intelligence methods and processes that I have been able to apply to my hobby. It has been a powerful and rewarding combination. I have no idea in what order Mr. Halper acquired these jerseys. By that I mean if he acquired them both at the same time, were they found satisfactory because they were consistent with each other? If they were acquired over time, were they found satisfactory because the more recent acquisition was consistent with the former? When they were offered for subsequent sale, were they both seen as satisfactory because one compared well to the other and they came from the prominent source? -Know what right looks like before you buy. - Provenance can only make an item more desirable, it can’t make it into something it is not, no matter the source. When collectors choose to forgo this simple advice, the jersey of their dreams can turn into a nightmare overnight. While you can always wake up from a bad dream…a $26,450 nightmare is a bit tougher to slough off in the morning. Great analysis and ADVICE by one of the industries best. What a great detective job. Its good to know there’s someone like Grob in the uniform authentication biz that’s finally giving these uniforms the proper analysis. Feel bad for the collector who got stuck with this. I hope he gets a refund from Sotheby’s. 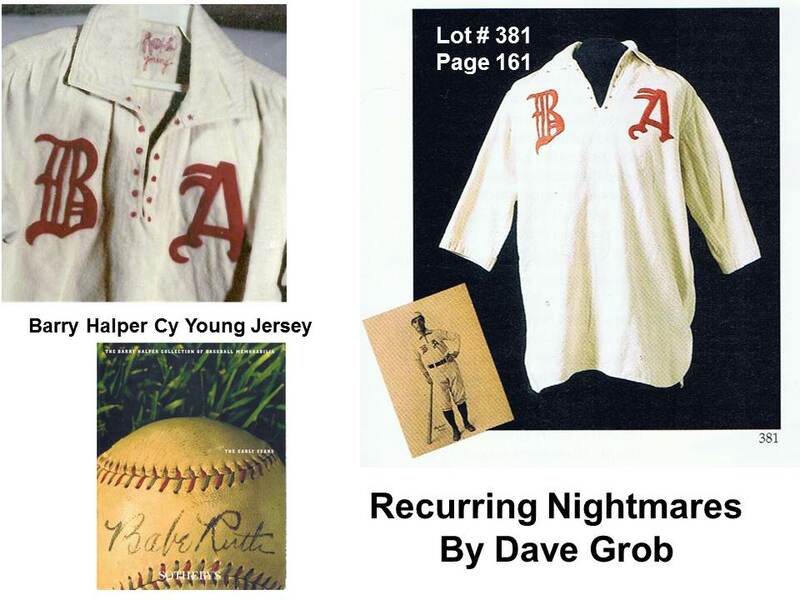 I appreciate Dave’s service to the game used jersey community! Found out about the site over at UniWatch. Excellent analysis and article by Dave Grob from Mears. Looks like “Dressed to the Nines” has some corrections to make. Barry Halper again. This man is poison to the game. Not saying everything that he had was fake, but you now have to wonder aloud about every item.